As part of the planning process for updating its Comprehensive Master Plan, the City of Rye hosted an opening public workshop September 26, 2017. The workshop was attended by approximately 60 participants, including members of the Task Force, City Council, and the community. The workshop opened with a presentation by the planning consultants explaining the overall process and objectives for the workshop. Following the presentation, participants were welcomed to rotate through a series of open house stations, which were organized to seek input on goals and objectives for the plan. Participants discussed comparisons with the City’s existing Comprehensive Plan and issues related to preservation, zoning, land use, transportation and many more. The next steps in the Comprehensive Planning process involve coordination between the consultant and the City to finalize the planning goals and objectives, develop a vision statement and to draft chapters of the plan together with the Task Force. A second public workshop will be held in January to get public input on preliminary recommendations for the Rye Plan. The Rye CMP Task force met on September 18 to discuss the upcoming public workshop format and objectives. In addition, the consultant provided a report about recent stakeholder focus groups and meetings with City staff. Click here to download the meeting presentation. Click here to download the meeting summary. The next Rye CMP Task Force Meeting is on October 16, 2017 from 7:00 pm - 9:00 pm at Rye City Hall. The City of Rye is undertaking the first Comprehensive Master Plan update since 1985. The goal of the plan is to create a strategic vision for the City’s future and prioritize actions and strategies to implement that vision. The updated Plan will seek to address what aspects of Rye should be protected and preserved, what aspects should change in order to grow in a manner consistent with the community’s vision, and what community services and infrastructure needs to be provided to support Rye’s current and future population. Rye has contracted with a consultant team led by New York City-based BFJ Planning, a firm with experience in comprehensive planning throughout Westchester County and with strong local knowledge of Rye. The Comprehensive Master Plan will cover a broad array of topics, including the City’s place within the region; socioeconomic trends; sustainability initiatives; natural and coastal resources; historic and cultural resources; business and commercial areas; housing; community facilities; parks and open space; transportation; infrastructure; and flood control. The Plan will conclude with a map illustrating desired future development patterns in Rye and a series of strategies to implement the document’s recommendations. The first public workshop will be held on Tuesday, September 26, from 7 p.m. to 9 p.m., at Rye City Hall, located at 1051 Boston Post Road. The City strongly urges Rye residents, property owners, business owners or any other interested parties to come to the workshop and share ideas about issues facing the City and opportunities to make it an even better place. A second workshop is anticipated to be held in December, and the final workshop in January or February 2018. 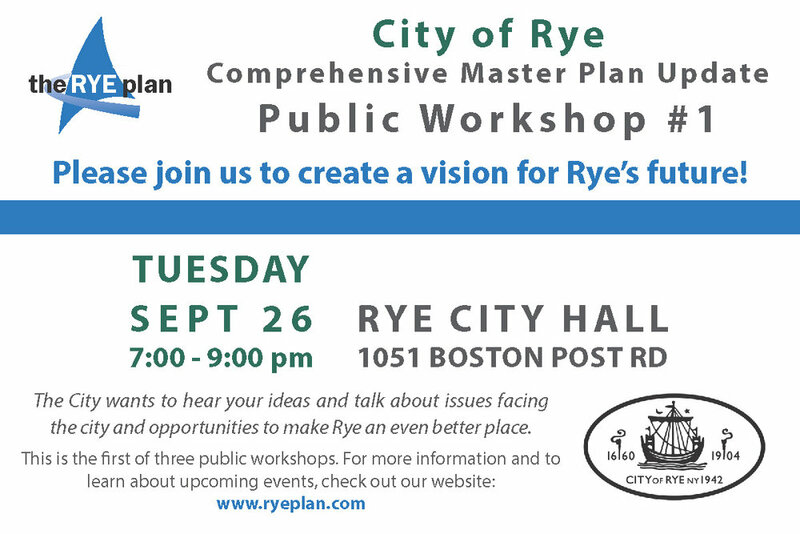 Please visit www.ryeplan.com for more information on these workshops and the Comprehensive Master Plan update process. On August 20, 2017, the Rye CMP Task force met for the third time. At this meeting, the Task Force discussed public outreach strategies to get the word out about the first public workshop. The first workshop is coming up on September 28, 2017. The next Task Force meeting is scheduled for September 18, 2017 from 7:00 pm - 9:00 pm at City Hall. As part of the planning process for updating Rye’s Comprehensive Master Plan, the BFJ team attended the Annual Sidewalk Sale on July 27 and 29, 2017 to gain feedback from the public and promote upcoming public meetings and workshops. BFJ along with City staff and members of the task force had a station located at the corner of Elm and Purchase Streets, where they encouraged members of the public to participate in a visioning exercise, gathered contact information and handed out flyers with additional information about the planning process. Members of the public participated in a variety of ways, including informal conversation with planners, contributing to a “word cloud” visioning exercise and picking up flyers directing them to the Plan’s website. Approximately 20 people answered the question “Where do you see the City in 5-10 years?” on a word cloud designed to generate visioning ideas from the public. A number of respondents also included comments and ideas they had for the City’s Plan, and discussed additional concerns with BFJ representatives. The next steps in the Comprehensive Planning process involve coordination between the BFJ team and the City to draft chapters of the plan together with the task force. An opening public workshop will be held on September 26 to introduce the process and discuss the public’s vision for Rye’s future. On July 19, 2017, the Rye CMP Task force met for the second time. At this meeting, the Task Force reviewed preliminary demographics research, discussed major issues and opportunities that the plan should address, and talked about different ways to get the word out and make sure the community is aware of the ongoing process. The next Task Force meeting is scheduled for August 16, 2017 from 7:00 pm - 9:00 pm at City Hall. Click here to download the presentation from the meeting. The Rye Comprehensive Master Plan Task Force held the first meeting to kick-off the CMP process on June 21, 2017. The key focus of this meeting was to review the outline of plan topic areas to guide research throughout the process and to refine the public outreach strategy. The Task Force also began a preliminary conversation about key issues that the plan should address. The discussion about issues and opportunities will continue at future Task Force meetings, focus groups, and public workshops, which will begin in the fall of 2017. The next Task Force meeting is scheduled for July 19, 2017 from 7:00 pm - 9:00 pm at City Hall. Welcome to the Rye CMP! The process to update the City of Rye Comprehensive Master Plan began in June 2017. The CMP Task Force, City staff, and planning consultants will be conducted preliminary research over the summer, but also keep an eye out for updates at local events. The first public workshop is scheduled for September 2017. More details will be posted here. For more information, click on the Get Involved! tab and Subscribe to submit your email and receive updates throughout the process.